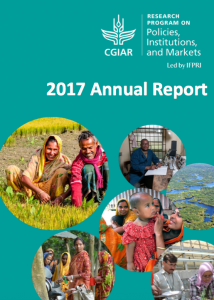 The CGIAR Research Program on Policies, Institutions, and Markets (PIM) leads action-oriented research for a food-secure present and future. 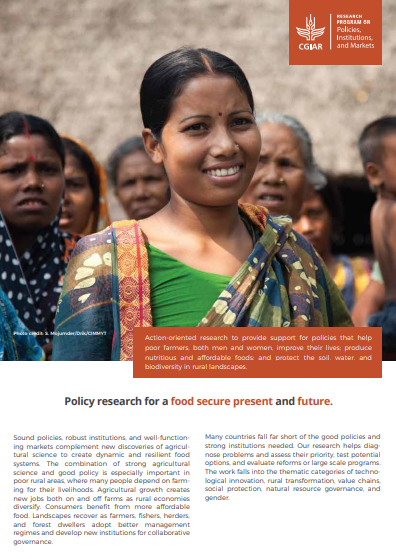 Our research provides support for policies that help poor farmers, both men and women, improve their lives; produce nutritious and affordable foods; and protect the soil, water, and biodiversity in rural landscapes. Sound policies, robust institutions, and well-functioning markets complement new discoveries of agricultural science to create dynamic and resilient food systems. The combination of strong agricultural science and good policy is especially important in poor rural areas, where many people depend on farming for their livelihoods. Agricultural growth creates new jobs both on and off farms as rural economies diversify. Consumers benefit from more affordable food. Landscapes recover as farmers, fishers, herders, and forest dwellers adopt better management regimes and develop new institutions for collaborative governance. PIM is a global program, with special emphasis on Africa south of the Sahara, Bangladesh, India, and selected countries in East Asia, Southeast Asia, and Latin America. IFPRI is the Lead Center of PIM. The IFPRI Director General (DG) and IFPRI Board are responsible for the performance of the program. The PIM Program Director manages the Program Management Unit (PMU), chairs the Management Committee, and is accountable to the DG of the Lead Center and the Lead Center Board for all aspects of the program’s performance. In Phase 2 (2017-2022), the Independent Steering Committee (ISC) replaces the Science and Policy Advisory Panel from Phase 1 (2012-2016). The ISC will provide independent advice to the Management Committee and the Lead Center Director General on strategic directions, research priorities and focus, and relevant management and partnership issues for PIM. 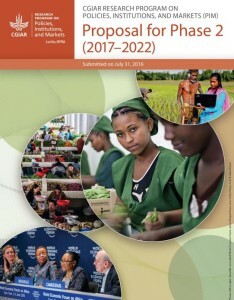 Flagship and Cluster leaders provide the strategic direction to the flagships/clusters, contribute to resource mobilization and development of partnerships, assist with design of detailed annual work programs, provide technical guidance for quality assurance, report on progress and budget execution, and track outcomes and impact. The Management Committee (MC) consists of the Program Director, the Flagship leaders, the Gender Platform coordinator, a representative of Centers with significant contribution to the program, and a representative of implementation partners. The MC assists the Director inter alia in developing the work program, overseeing its implementation, assuring adequate monitoring and evaluation (M&E), implementing the partnerships strategy, and raising funds. The Program Management Unit provides operational support to the Program Director and the Management Committee. Visit this page to download PIM's logo and access PIM's Branding and Acknowledgement Guidelines.